Met and welcomed by a Christian Holyland Tour representative and transfer to your hotel. 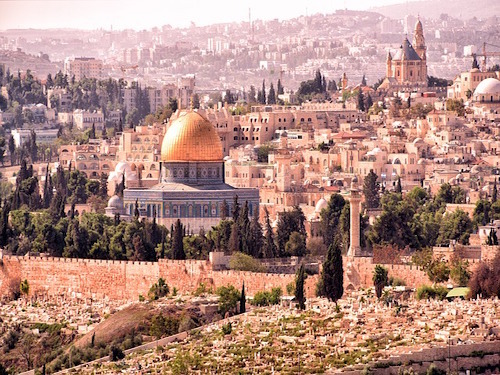 Your tour starts with breakfast followed by ascending the Mount of Olives for awonderful panoramic view of the Old City ofJerusalem with the Temple Mount. Your tour continues with a drive to the Garden of Gethsemane, the place where Jesus was arrested (Matthew 26: 36-58), to see the old olive trees and visit the Basilica of the Agony. The next stop is in the area of Golgotha (place of the skull) and the Garden Tomb, where you will celebrate the resurrection with communion and a time of Praise. Next you’ll travel through the Kidron Valley for a panoramic view of the Tomb of Absalom, the Tomb of the priests’ family B’nei Chanzir and the Monument to Zechariah and visit the Town of David and the Pool of Siloah. Your drive then continues to the garden of the Holyland Hotel to see the Model of Jerusalem as it was at the time of the Second Temple. Next you’ll visit the Israel Museum with its Shrine of the Book, where the Dead Sea scrolls are kept, and then see the Menorah in front of the Knesset – the Israeli Parliament. After that it’s back to your hotel for the night. After breakfast you’ll drive to the Lion’s Gate and walk into the Old City to visit the Church of St. Anne and the Pool of Bethesda (John 5: 1-15). From there you’ll continue walking through the Via Dolorosa along the Stations of the Cross from the remains of the Antonia to the Church of the Holy Sepulcher and through the colorful bazaar t0 the Jewish Quarter. In the Jewish Quarter you’ll visit the Cardo (a Roman’s street) and the excavated Herodian Quarter. Your walk then continues to the holiest place for the Jews, the Wailing Wall. Your last destination for the day will be a drive to Mount Zion to visit the Room of the Last Supper (Cenacle) and the Tomb of King David. From there you’ll return to your hotel for the night. Your breakfast is followed by a drive to Abu Gosh, the biblical Kiryat Ye’arim, where King David brought the Holy Shrine back toJerusalem. Driving via Emmaus (Latrun) (Luke 23: 39-44), you’ll continue on to Beit Shemesh and the Elah Valley, where David fought with Goliath. Next on your itinerary is Beersheba and the city of Abraham where you’ll visit Abraham’s Well, the site where Abraham and Avimelech swore not to fight against each other any more. The drive then continues through the Silots’ Valley, northeast of Arad, to Kfar Anokdim where you will be treated to a typical dinner in a Bedouin-style tent and hosted as a feast as it was at the time of Abraham. After dinner you’ll drive to your hotel in the Dead Sea area for the night. Your day begins with breakfast and a drive along the shores of the Dead Sea to the oasis of Ein Gedi, where David was hidden from King Saul (Samuel I, 23: 29 and Samuel I, 24: 1). From there you’ll take a walking tour in the Nahal David to the waterfalls and then back to the bus to drive to Qumran. Qumran is the city of the Essens where the Dead Sea scrolls were found in a cave by a shepherd. You’ll have time for a short break, and the possibility of a “dip” and “float” in the salty water of the Dead Sea which is the world’s lowest place. Your day ends with a drive through the Jordan Valley to Tiberias for the night. First breakfast, then a boat ride on the Sea of Galilee where Jesus walked on the water (Matthew 14: 22-23). Your boat ride ends at Ginnosar, where you’ll visit the Ancient Boat dating from the time of Jesus and found nearby. Next you’ll drive to the Mount of Beatitudes (Matthew 5: 7) to visit the heptagonal church built by the Italian architect Berluzzi. From there you’ll proceed to Tabgha to visit the Church of the Loaves and the Fish (Matthew 14: 14-34). You’ll continue driving along the north shores of the Sea of Galilee to Capernaum, the town where Jesus lived in the house of Peter and performed his miracles and healings (Matthew 4: 13, Matthew 8: 14-15). Next stop is near Beit Saida (John 1: 45) to visit Gerase (Matthew 5: 1-20), followed by returning to hour hotel for the night. After breakfast you’ll drive to the Golan Heights and climb Mount Bental, where you will enjoy a breathtaking view of the Golan Height to Mount Hermon and into Syria. Your drive continues through the Druze villages to Banyas, the ancient Caesarea Philippi (Matthew 16: 13-20), one of the main sources of the Jordan River. You’ll continue on to Tel Dan, the capital city of the Dan tribe (Judges 18: 27) and to the Dan Springs. Dan was also ordered the “Judge of the Sons of Israel” – see the Blessing of Jacob (Genesis 49: 14). Next stop is your hotel for the night. Following breakfast you’ll drive to Mount Tabor, the site of Transfiguration, to visit the Catholic Church (Matthew 17: 1-8). You’ll enjoy a beautiful view of the Lower Galilee and the Plain of Jezreel. Next you’ll journey to the village of Nain, where Jesus resurrected the son of the widow (Luke 7: 11-17) from the rooftop of the church. Your drive continues on to Gideon Springs, where Gideon gathered the sons of Israel to fight the Medianates (Judges 7: 1). From there you’ll proceed up to Mount Gilboa, where King Saul and his sons were killed by the Philistines (Samuel II, 1: 21). On the way back to the hotel you’ll stop at the Yardenit Baptismal site. After breakfast you’ll drive to Nazareth , via Cana, to visit the Church of Annunciation (Luke 26: 28). From there you’ll travel through the Jezreel Plain to Megiddo, also named Armageddon as it’s the place where the last battle of mankind is due to take place (the Apocalypse of St. John), to visit the Museum and the 5,000 year old city whose Gates date from the times of King Solomon. You’ll also see the old Canaanite temples and the water tunnel from the time of King Ahab. Next stop is Mount Carme to visit the Monastery of the Muhraka, where Elijah fought with the Baal priests. The roofs of this Monastery provide a beautiful view of the Jezreel Plain. Next it’s back to your hotel for the night.